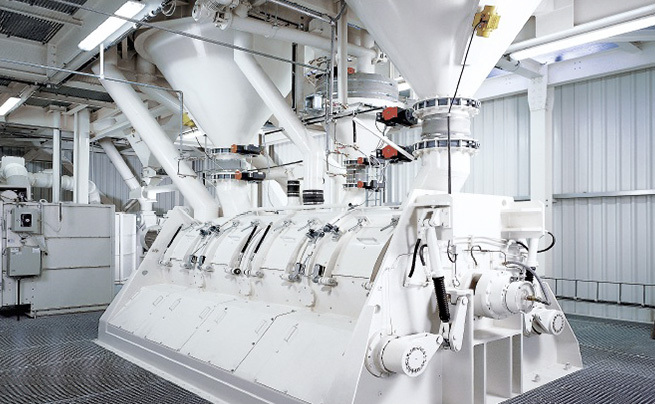 For the mass cement production with 2-3 main components and with different degrees of grindability it is advisable to perform a separate grinding of the components with the subsequent mixing in flow-through mixers. The grain size distribution of the individual components can be influenced separately. Often the primary materials such as fly ash are already available in the required fineness, and joint grinding with clinker only consumes unnecessary energy. Accordingly, the use of flow-through mixers provides for a swift amortisation, additionally allowing an increase of the grinding output of the cement mills. Discontinuous mixing systems, as the IBAU Batch-type mixer, are used for the production of special types of cement with a large number of main and secondary components and/or frequent product changes. These systems provide for the production of specific recipes “just-in-time”.